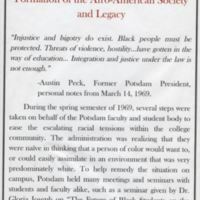 Materials curated from the College Archives & Special Collections by Jeanette Sanchez in 2012 in an exhibit to showcase the growth of diversity at SUNY Potsdam. 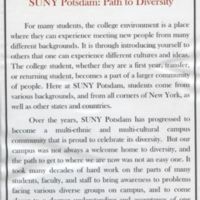 Item 1 is a narration by Jeanette Sanchez that explains that the purpose of the exhibit is to detail the growth of diversity at SUNY Potsdam, using materials curated from the College Archives & Special Collections. 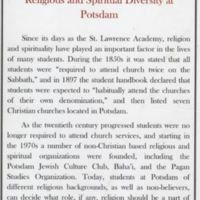 Item 1 is a narration written by Jeanette Sanchez about the development of religious diversity at SUNY Potsdam. 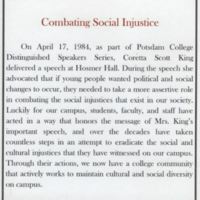 Item 1 is a narration written by Jeanette Sanchez about efforts to oppose social injustices at SUNY Potsdam. 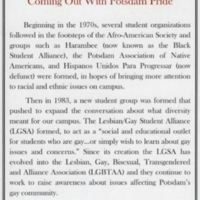 Item 1 is a narration written by Jeanette Sanchez about the growth of student organizations at SUNY Potsdam that were formed in the hopes of bringing awareness to racial, ethnic, and gay issues on campus.